morning times are a dangerous time for injuries. still semi-unconscious, sometimes i twist and turn just when i'm about to wake up and i end up pulling a muscle in the wrong way. this was the case this morning as i could feel my neck muscles shifting out of alignment. fortunately it fixed itself by the time i left for work. it was really hot today, 81 degrees, and i didn't leave the comfort of the air conditioned office except to help james find some tapioca balls and fatty straws so he can make bubble ice tea at home for his girlfriend. on the subway going home i bumped into david wohlgemuth, former screen house project manager, working full-time in boston at a new company since this spring, just a few blocks away from where i now work. we made tentative plans to grab some lunch one of these days. arriving at porter station, i bought some flowers (irises, suddenly feeling in the mood for flowers again), then went home to pick up julie's mint plants, before walking to her place in davis square. 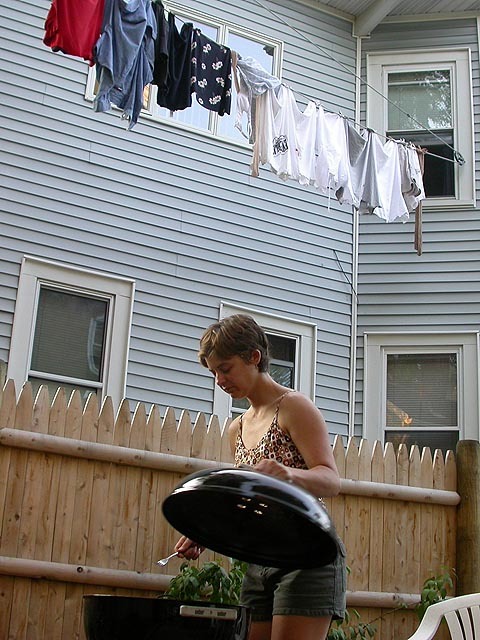 i found julie in the backyard, poking at her weber grill, moving the burning brickets around with a pair of oversized barbecue tongs. julie, who doesn't eat beef (something about mad cow disease, which i thought was irrational), made turkey burgers and chicken sausages. back inside the house, we cooked up some curly fries with the toaster oven. we watched the red sox yankees game (johana came home and watched the final few innings with us, i also met their new 6-weeks temporary roommate), which was going fine until the inning where the red sox loaded the bases with nobody out and couldn't score in a run despite johnny damon and david ortiz coming to the plate. though the red sox were still up 2-0, the yankees came back like they always do, and ended up beating the red sox on a pair of david ortiz errors. the game was ortiz's to win or lose, and apparently he decided to lose (and to a lesser extent, i blame pitcher mike timlin for not listening to the catcher mirabelli to throw outside on an 0-2 count to sheffield). i am just in awe over how bad the red sox played, and how the yankees always find a way to beat us in these close games. tony clark is a traitor, and so is tom gordon (any vintage red sox t-shirts with their name and number should be gathered and burned), and mariano rivera has obviously made a pact with the devil to be the best closer in baseball history. i took the loss pretty hard, screaming into a sofa pillow, "i hate baseball." i left close to 11pm, walked back home, the fragrance of night blooming roses heavy in the summer air, stopping off at star market to get some cherries ($1.50/lb.) and watermelon ($4/each), both on sale.